VS. Ronald Weinland Says His Books and His Interpretations of the Bible Are What He Wants Potential Supporters to Study. The COGwriter Site Instead Urges Those Interested in Him and End-Time Prophecies to Spend More Time Checking His Writings with the Bible. Over the coming months, planning visits to specific areas will become more difficult as destructive events strike in different locations. As we look to God to lead us in our planning, we are going to continue sending elders to locations where growing numbers of people are seeking baptism and fellowship with God’s Church. We are going to focus on serving those whom God is calling as long as we are able to accomplish such work, and as we move forward through the Four Trumpets that will sound first, we will have to be very flexible in how this is accomplished. As God reveals the work His two witnesses are to accomplish, we will keep you posted in as timely fashion as we are able. God has not yet revealed all that we are to accomplish or the areas in which such things will be done. That will be a progressive revelation to His two end-time witness, whose job formally begins on April 17th. It seems that this has been there for several weeks now. Yet, there has been no real “witness” from Ronald Weinland and his wife (who he declared began the 1260 days of being God’s two witnesses on April 17th). There have been no miracles from he or his wife. They also do not wear sackcloth. Nor has any far-reaching news media outlet paid any real attention to the Weinlands. And while destructive events may occur, the Great Tribulation did not start two weeks ago. The Weinlands certainly ARE NOT doing the job that God states that His two witnesses would do (see Revelation 11:3-6) . While Ronald Weinland can change what he guesses will happen (please see Ronald Weinland Changes and Delays, But Without Apology), the fact is that what the BIBLE teaches MUST happen simply has not (for one related item, please see RW’s Wife the 2nd Witness? Comparing 4/17/08 and the Bible to “2008 God’s Final Witness”). Hopefully, followers of the Weinlands will realize this and spend more time looking into their Bibles and STOP trying to see if Ronald Weinland’s sermons or books have the answers that they are seeking. Posted in COG News | Comments Off on Ronald Weinland, Where is the Witness? Where is the Great Tribulation? If you watch enough TV news and TV ads you will become depressed. Ads are designed to make us dissatisfied with our lives. They may also appeal to our fears in order to motivate us. Jesus warned against getting depressed and used the same word Paul did. We are not to let our “hearts” (minds) become “pressed down,” “burdened,” “weighed down,” or depressed by “dissipation” (KJV= surfeiting) which means dizziness, drunken headache as a result of too much partying with alcohol. In effect it is a hangover from a drinking bout. He mentions “drunkenness” directly and the “worries of life.” People can worry themselves into depression. It is also interesting that the number one cause of depression in American is alcohol. Jesus was depressed the night before He was to be crucified. In Mark 14:33 Jesus is referred to as “distressed and troubled.” The word troubled is a Greek word that means depressed and anxious. The mind is whirling and frantic. Another Gospel refers to Jesus also as depressed, anxious and in mental anguish or pain. That is real depression! But we can make ourselves depressed over imagined things by playing one of Eric Berne’s “games” – Aint It Awful. We can start to see everything in a negative light. Another thing we may do is to view things through the lenses of our own problems – marital, financial, health, job, etc. We may play a game I call “I Don’t Want To Fix It I Just Want To Gripe.” We begin to criticize what is NOT done. You can always find something that is not done. The cure for this pseudo, self-generated depression is thanksgiving. When you give thanks you take stock of what you do have not what you don’t have. It keeps self-made depression away! Try it! Of course, there are many causes of depression as well as various interventions to help cure it. Understanding why you were born as well as what God’s plan is for YOU can also be of great help. What is the Meaning of Life? Who does God say is happy? What is your ultimate destiny? Do you really know? Does God have a plan for YOU? What is it? When you see a thief, you join with him; you throw in your lot with adulterers. You use your mouth for evil and harness your tongue to deceit. You speak continually against your brother and slander your own mother’s son. These things you have done and I kept silent; you thought I was altogether like you. But I will rebuke you and accuse you to your face. Consider this, you who forget God, or I will tear you to pieces, with none to rescue (Psalms 50:18-22 NIV). Many act like there is no God or are misled by those who claim to represent Him (Ronald Weinland comes to mind–see Concerns About Ronald Weinland’s Church of God-Preparing for the Kingdom of God; also the “True Bible Code” as their prophecy for last weekend did not come to pass, see news item Europe to Launch Satellite for Galileo, But More False Witnesses). But despite false witnesses and those who ignore God, the end will come. Which Nations Read the Bible? VATICAN CITY (April 28) – Americans are among the world’s most ‘Bible-literate’ people and Spaniards, French and Italians are among the most ignorant about what the “good book” says, according to a new study released on Monday. A poll carried out in nine countries — the United States, Britain, Germany, France, the Netherlands, Russia, Italy, Spain and Poland — also showed Americans were most willing to donate money to spread the message of the Bible. The poll for the Catholic Biblical Federation interviewed Christians and non-Christians ahead of a synod of Roman Catholic Bishops on the Bible due to be held at the Vatican in October. Most respondents in the poll, which was presented at the Vatican, were Christian. Except for in the United States, Britain and Russia, most of the Christians respondents were Catholic. Asked if they had read a phrase from the Bible in the past 12 months, 75 percents of American respondents said yes, while between 20 percent and 38 percent of respondents in the other eight countries said yes. While it is nice to live in a country where people sometimes read the Bible, people everywhere need to read it more and do what it actually says–including the United States. And partially because of their lack of biblical knowledge, the Europeans are setting themselves up to ultimately support two false religious leaders that the Bible shows will arise, probably within the next decade. The fact is that very few people seem to know what the Bible actually teaches, what early Christians actually believed, how real Christians are supposed to live, and what the Bible really shows will happen in the future. Posted in Doctrine | Comments Off on Which Nations Read the Bible? On Friday, April 25th, I received the hard copy of the United Church of God’s Festival Planning Brochure for 2008 and an email of the pdf version of the Living Church of God’s Festival Planner for 2008. Combined, these two groups may have more actual Feast of Tabernacle attendees than the other COGs combined. “All together at the 62 sites around the world, 20,476 attended the Feast with United” (United Brethren Enjoy Feast at 62 Sites. United News. November 2007, p.1). “More than 7,100 Living Church of God brethren kept God’s Feast of Tabernacles and Last Great Day in 30 countries and at 45 sites around the world.” (2006 Feast of Tabernacles Reports. Living Church News. Nov-Dec 2006). In 2008, the Feast of Tabernacles will begin the evening of October 13 and, including the Last Great Day, run through the evening of October 21st. There will probably also be LCG sites, as there were in previous years, in places such as India, Myanmar, Nigeria, and possibly Thailand and elsewhere. UCG has Feast sites in many (but not all) of the same nations, and even the same cities in some cases, as LCG (this occurs, because there are many Differences between the Living Church of God and United Church of God–differences that many are not aware of). UCG also has some unique countries of its own with Feast sites in places such as Mauritius, Rwanda, Togo, and Tonga. Online registration for United States and Canadian sites for the Living Church of God will begin on May 4. Watch for more information in The World Ahead and on the MyLCG website, www.cogl.org. I just read a moment ago that UCG members were to provide a hard copy of their registration forms to their local ministers yesterday–so hopefully none of them received their Planner later than I did–unless of course, they decide instead to go to a LCG site :). Anyway, since travel is almost always required for the Fall Festivals, planning should begin now for those interested in actually attending. This morning, I listened to the beginning of Ronald Weinland’s sermon of 4/26/08 titled Back to the Future. So some were really stirred up and curious over what would be said, obviously concerning the 17th, some had ears to hear, and obviously, there were a lot that didn’t. And that’s the way it’s always been, and those being drawn by God through the normal process obviously were able to hear it, when I think about what Daniel said when he said there are things we would understand and there’s only one reason and that’s because of God’s Spirit leading, guiding, directing and working with us, and that’s the only way anyone can really hear, spiritually, what was being given. I, COGWriter, also think about what Daniel said/wrote. Actually, what is clear is that if people would look into their Bibles, they would see that NONE of what Daniel wrote that should have occurred on the beginning of 1335 days, 1290 days, and 1260 days, which according to Ronald Weinland were 2/2/08, 3/18/08, and 4/17/08 respectively occurred. Those who want to know what is expected to happen when BIBLE prophecy, and not Ronald Weinland’s false interpretations, are fulfilled should read the article on the Future King of the North? Later Ronald Weinland states that the second trumpet does not occur until after Pentecost which is June 8, 2008. Hence without Europe coming together until after that, the ten kings in Revelation 17:12, thus would not give their power over to the Beast, who is also the Future King of the North until at least the summer– even though the Bible shows that the Future King of the North MUST be around BEFORE the start of the 1260 days–and all should recall that Ronald Weinland stated that 1260 day start already happened on April 17th. Thus, Ronald Weinland is now somewhat admitting to a delays–but without apology. …but uh, it is very clear that we will not have anything happen on a massive scale to prevent us from coming together on Pentecost. If by Pentecost I’m just going to make this real clear to everyone. If by Pentecost it is not powerfully and abundantly clear that there has been a great deal of destruction that will clearly encompass a third of all plant life in the US and at least the clear results of this mingled with blood the death of very much animal life and the beginning of large numbers of human life then I will stop preaching. Just so all the critics and everyone out there will understand. I am true to my word in these things. OK? And for all the critics if by the end of July and for most likely around Pentecost if nothing has clearly caused great destruction and death I will make it very clear that I was a false prophet. I will do exactly what I said I would do on all of those interviews that I have held; to do less, aah well, would be quite insane. To do less. Well. Would be quite insane (Weinland R. Three More Weeks–quote from near the 1 hour 28 minute point from the CGPFK website version. Sermon given March 29, 2008). Since Pentecost in 2008 is June 8th, by mid-June Ronald Weinland has to stop preaching according to his own words or he is insane. Is something major supposed to happen BEFORE June 8th (Pentecost for 2008) or NOT? If not, then Ronald Weinland was a false prophet in March 2008. How long will people follow him? People need to compare what Ronald Weinland says with world events and the Bible. By doing that, it is clear to any with ears to hear or eyes to see that he is a false prophet. I have been warning about him for years. Hopefully people can see this now who he misled. Concerns About Ronald Weinland’s Church of God-Preparing for the Kingdom of God Ronald Weinland falsely claims to be one of the two witnesses God is raising up and that the end will come in 2008. Why is he a false prophet? He has at least one other view that suggests that he is not part of the COG. There are 11 major Orthodox churches in Montreal, serving about 100,000 people. The differences among them are ethnic or linguistic, not theological. The spiritual focus today is one of quiet mourning, solemn meditation and strict fasting, recalling Jesus’s entombment. Pascha, or Easter, will be celebrated after midnight tonight. The two Christian communities – Orthodox and Western rite – observe Easter vigils on different dates because they follow different calendars. And although the Orthodox are off by about a week (the last day of Unleavened Bread was yesterday and Passover was sunset after April 18th), they are closer to the date than the Catholics or Protestants (most of whom do not realize that what they call Easter was originally supposed to be Passover moved to a Sunday observance. 193 A.D. – Council of Rome, presided over by Bishop Victor, condemns the celebration of Pascha on Nisan 14, and addresses a letter to Polycrates of Ephesus and the Churches in Asia. 193 A.D. – Council of Ephesus, presided over by Bishop Polycrates, and attended by several bishops throughout Asia, reject the authority of Victor of Rome, and keep the Asian paschal tradition (Markou, Stavros L. K. An Orthodox Christian Historical Timeline. 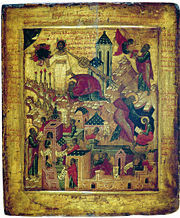 Copyright © 2003 OrthodoxFaith.com). 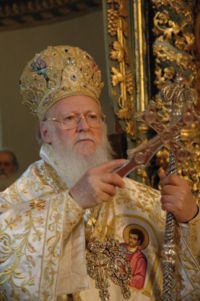 Although It appears that the Orthodox Church officially began to accept Easter around 190 A.D. (as it, as a Sunday holiday, originated in Rome a few decades earlier, though the churches in Asia Minor did not accept the change from Passover on the 14th of Nisan), those in Asia Minor (where it claims apostolic succession) did not accept the Roman change. Yet, the Orthodox Church officially made the change, based not on the Bible, but on a church council/synod. Most who call themselves Christians do not realize that Passover was celebrated by pretty much all those who professed Christ in the first and second centuries. And that the change to Easter Sunday was because of Roman pronouncements. The change involved MORE than simply the date–the practices and meaning were also sadly changed from that the early true Christian church had as history records. I watch the program that aired on CNN Headline News tonight, the Glenn Beck program. Mr. Rosenberg is very interesting man and is on target on many of his viewpoints, but seems to have a few inaccuracies in his understanding and expectations to do with Bible prophecy. And although Joel Rosenberg seems reasonable enough and does understand that we are in the end times, he too, like most out there, simply does not understand the specifics of Bible prophecy (he, for example, believes in an evangelical version of the rapture theory and misunderstands Ezekiel 38). Glenn Beck himself seems to be a Mormon (some doctrinal information on the Mormons is in the article Five Dissimilarities Between The Church of Jesus Christ of Latter Day Saints and the Living Church of God) with interest in end-time prophecy (Glenn Beck has had previous segments on prophetic matters, but this is only the second time I am aware of that his entire program was devoted to this). But what I wish to focus on in this post is that fact that neither the Glenn Beck program nor any major news outlet has been covering Ronald Weinland. It has been 10 days since he and his wife supposedly were given the power to begin their claimed 1260 day ministry as the two witnesses. 3 And I will give power to my two witnesses, and they will prophesy one thousand two hundred and sixty days, clothed in sackcloth.” 4 These are the two olive trees and the two lampstands standing before the God of the earth. 5 And if anyone wants to harm them, fire proceeds from their mouth and devours their enemies. And if anyone wants to harm them, he must be killed in this manner. 6 These have power to shut heaven, so that no rain falls in the days of their prophecy; and they have power over waters to turn them to blood, and to strike the earth with all plagues, as often as they desire (Revelation 11:3-6). Thus far, there was been no power, no miraculous signs (although Ronald Weinland did essentially call for a limited plague against those he called mockers, please see Ronald Weinland Again Calls for Death). And perhaps just as interesting, there has been no effective witnessing to the world (which he claimed would occur by now (please see the article on the Church of God, Preparing for the Kingdom). In Ronald Weinland’s sermon, which I presume he will give later today, I suspect that he will mention economic problems, grain shortages (which have been covered here, please see Rice and the Beginning of Sorrows), and why those he calls “mockers” are wrong. Perhaps he will modify his sermon today, but the main emphasis that Ronald Weinland seems to have had in the past two sermons of his that I heard (3/29/08 and 4/19/08) is that God will strike down those that oppose him and that people need to rely on Ronald Weinland’s current explanation of his book. That is the wrong emphasis. Apologize to me (and now others) for the disdain whereby he treated me two years ago, and how he has treated those that pointed out why he was wrong ever since. Give me the www.the-end.com URL 🙂 since he misused it, while the cogwriter website has been properly explaining end-time events during the time he has been around. Anyway, there are probably a few more things that he should do now, but that list is at least a start. It’s been ten days since Ronald Weinland claimed that God began his and his wife’s 1260 day job as the two witnesses–but they have not been effective witnesses as they STILL are being basically ignored by the world. Nor are they close to converting millions like he indicated that they should be (for more details, see Ronald Weinland Prophesied Millions & Is Spending to Accomplish That) by now. The Weinlands are NOT God’s two end-time witnesses. There was a time after the fall of Communism when small Protestant congregations blossomed here in southwestern Russia, when a church was almost as easy to set up as a general store. Today, this industrial region has become emblematic of the suppression of religious freedom under President Vladimir Putin. Just as the government has tightened control over political life, so, too, has it intruded in matters of faith. The Kremlin’s surrogates in many areas have turned the Russian Orthodox Church into a de facto official religion, warding off other Christian denominations that seem to offer the most significant competition for worshipers. They have all but banned proselytizing by Protestants and discouraged Protestant worship through a variety of harassing measures, according to dozens of interviews with government officials and religious leaders across Russia. Putin makes frequent appearances with the church’s leader, Patriarch Aleksei II, on the Kremlin-controlled national television networks. Last week, Putin was shown prominently accepting an invitation from Aleksei II to attend services for Russian Orthodox Easter, which is this Sunday. The relationship is grounded in part in a common nationalistic ideology dedicated to restoring Russia’s might after the disarray that followed the end of the Soviet Union. The church’s hostility toward Protestant groups, many of which are based in the United States, or have large followings there, is tinged with the same anti-Western sentiment often voiced by Putin and other senior officials. The government’s antipathy also seems to stem in part from the Kremlin’s wariness toward independent organizations that are not allied with the government. Here in Stary Oskol, 300 miles south of Moscow, the police evicted a Seventh-day Adventist congregation from its meeting hall, forcing it to hold services in a ramshackle home next to a construction site. Evangelical Baptists were barred from renting a theater for a Christian music festival, and were not even allowed to hand out toys at an orphanage. A Lutheran minister said he moved away for a few years because he feared for his life. He has returned, but keeps a low profile. On local television last month, the city’s chief Russian Orthodox priest, who is a confidant of the region’s most powerful politicians, gave a sermon that was repeated every few hours. His theme: Protestant heretics. The Russian Constitution guarantees freedom of religion, and Putin has often spoken against discrimination. “In modern Russia, tolerance and tolerance for other beliefs are the foundation for civil peace, and an important factor for social progress,” he said at a meeting of religious leaders in 2006. Putin has also denounced anti-Semitism. While many Jews have emigrated over the past two decades, the Jewish community — now a few hundred thousand people — is experiencing something of a rebirth here. Anti-Semitism has not disappeared. But in some regions it seems to have been supplanted by anti-Protestantism and, to a lesser extent, anti-Catholicism. Mikhail Odintsov, a senior aide in the office of Russia’s human rights commissioner, who was nominated by Putin, said most of the complaints his office received about religion involved Protestants. This absence looms especially large at the regional level. At the request of a Russian Orthodox bishop, prosecutors in the western region of Smolensk shut down a Methodist church last month, supposedly for running a tiny Sunday school without an educational license. The church’s defenders noted that many churches and other religious groups in Russia ran religious schools without licenses and had never been prosecuted. The FSB has been waging a battle across Russia against Jehovah’s Witnesses. In Nizhny Novgorod, in the nation’s center, the local Jehovah’s Witnesses have had to cancel religious events at least a dozen times in the last few months after the FSB threatened owners of meetings halls, the church’s members said. In February, some officials in the Siberian city of Novosibirsk, Russia’s third largest, proposed creating a commission to combat what it called “totalitarian sects.” The governor of the Tula region, near Moscow, charged that American military intelligence was using Protestant “sects” to infiltrate Russia. Officials do not say precisely which groups they are referring to, but Protestant ministers say the epithet is so widespread that most Russians assume the speakers mean all Protestants. The term has clearly seeped into the public’s consciousness. Like other parishioners interviewed, Gubareva said she supported freedom of religion. 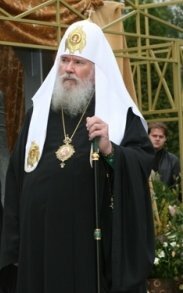 Few people in the West seem to know much about the “Orthodox” religion or any differences the Russian Orthodox have with the Greek Orthodox or the Living Church of God. And actually, just the dress of Patriarch Alexius II should should show those interested in biblical Christianity that Living Church of God leaders are more faithful to the Bible than Orthodox patriarchs are. With EU approval for a new bidding process, Europe’s much-touted — and much delayed — Galileo, a Brussels-controlled competitor to the US’s GPS system, looks set for orbit. One satellite is being launched this weekend and the system is expected to go online by 2013. After a debacle that saw leading companies in European industry withdraw their planned investment over fears of cost overruns, the European Union’s much-vaunted Galileo satellite navigation project appears to be getting a second lease of life. The European Parliament this week approved a plan to put the constuction of the satellite network, which will compete with the United States’ GPS system, out to tender. With no private industry investors on board, the project will now be paid for using €3.4 billion ($5.35 billion) in public funds through 2013. As I have been writing for quite a long while, I believe that Europe probably needs to have its own GPS-type system before the Great Tribulation begins. We now expect a dual terrorist attack in the US and the UK on 2008Iyyar19 or 2008Iyyar21, i.e. between the sunsets of April25/26 or April27/28. This is the fulfilment of the stone of Daniel2 hitting the image and of mushroom the cloud of 1Kings18 rising from the sea. We have got this wrong so far around 70x. This is the first birth pang of the Kingdom of God, so it should not be large attack by biblical standards, since the first birth pang is the smallest. But it will be scary and significant and so may be radiological. This attack starts the Great Tribulation of Matthew 24. Jesus, the lamb of God, is now married. So the late passover this year, on 2008Iyyar14, is the evening meal of the lamb’s marriage. The Lords’ Witnesses are the only church that knows how to celebrate this seminal event properly (http://www.truebiblecode.com/ viewed 4/24/08). I cannot believe people like this are serious, but whether they are or not, people need to READ their Bibles and realize that the END CANNOT COME in 2008 (and that groups like the Living Church of God do know how and when to observe Passover and the Days of Unleavened Bread, which they called “the Festival of Cakes”). Perhaps, I should also add, that like CGPFK’s Ronald Weinland who seems to pushed his dates out further, I was told that this “True Bible Code” page predicted 17th to 21st April as the possible nuclear attack on USA and UK until early yesterday–and that it has made other inaccurate date predictions prior to that date (of course, if they predict it for every possible date in the future, at some point they may get it right 🙂 ). While terrorist events can, and sometimes will, happen, the Great Tribulation has not started and will not start this weekend. What the Bible shows MUST happen has NOT happened yet. You are currently browsing the Church of God News weblog archives for April, 2008.